Home Persone e Società	How to build, guide and maintain an efficient and modern company culture? Interview Time with SLADE SUNDAR: Builder of Cultures, Companies and Brands. #cisonopersone project international edition: we have a special guest today, Slade Sundar. We talked about his carrier and his personal behaviour to succeed and i have to say: he’s definitely able to inspire all of us. Slade spent decades building and growing all aspects of software startups (product, ops, marketing, people) in various industries including endurance sports, crowdfunding, civic journalism, and energy. He took leveraged those skills to become a startup “fixer” consultant, which gave him a unique insider perspective on the interaction between startups, communities, and startup ecosystems across Silicon Valley, London, and Paris. In his fixer role, he was hands-on in re-working culture, operations, product, and strategy, while training founders how to succeed. During his time as a fixer, he saved 15 VC funded startups from collapse. Currently, Slade is the founder of KRKN (www.getkrkn.com), a U.S.-based fitness apparel brand featuring pop-art athlesiure wear with the mission to focus on fun, remove the social pressure to perform, and a supportive, judgement-free fitness community. Slade is also an advisor to a number of startups across the U.S. and Europe in diverse industries ranging from remote work discovery (workfrom.co) to natural medical-grade skincare (kalvera.com). He also volunteers time to mentor startup founders at the Portland Incubator Experiment (piepdx.com). Slade, over the years Startup Founders asked you any sort of advice about a strategy that helps them make profit and an impact. How can they effectively learn how to build, guide, and maintain a company culture that promotes business goals? Building a performance culture requires a founder to look critically at themselves and what they want to accomplish with their company. A culture that promotes business goals should be built to include the founder’s strengths, but it also needs to address the founder’s weaknesses. Building the culture starts with the mission of the startup and is followed by the values – which are the shared philosophies the organization will follow. A shared philosophy and value system makes it easier to keep everyone accountable and performing no matter what the company is going through. This is especially important when companies are facing trouble or during times of rapid growth. In the past, I have taken founders through a “Goals to Culture” exercise. In this, we designed the culture that would fit the organization’s high-level goals. This exercise often reveals certain long-held values, behaviors, or beliefs that need to change dramatically — and the founders themselves need to commit to those changes before their performance culture becomes sustainable. To maintain this culture, the staff needs to hear a peer or a founder (ideally, both) use culture keywords and reinforce the shared philosophies whenever decisions are being made. This should happen in every meeting, every discussion. Linking business goals to the values and cultural guideposts show the employees how their individual work helps achieve the startup’s bigger plans. One of your quotes that I prefer is: “Everyone starts with a bag full of luck and empty bag of experience”, could you explain what do you mean and how is applicable in everyday life? Every day we are faced with new challenges. In each new challenge we start with a bag full of luck, and an empty bag of experience. What this means is that when good things happen, we should learn from them, because there’s going to be a time where bad things happen, and we need to have learned enough during the good times to prevent us from failing. An example of this is when founders raise capital. No matter how you feel about raising capital, in the end it is LUCK that someone will hand you money to build your business. Some founders get lucky multiple times, but ultimately, when that money runs out, you need to have gained enough experience to keep your business going. To put this into practice in everyday life, you need to treat every day as a lucky day. When you are alive, your business is running, and you have food to eat – that is luck. Then ask yourself if you have enough experience to keep that going? If not, learn what you need to do while you’re still enjoying the luck! All is about the individual culture, in fact your experience as entrepreneur, speaker and mentor gave you a privileged observatory about human kind, what is the fundamental characteristic to understand a startup ecosystems? There are many different groups that make up a startup ecosystem including investors, education systems, corporations, governments, and the community. The heart of understanding startup ecosystems is understanding what each of these groups value, what their goals are, and if all the groups are aligned or not? In asking those questions, the answers will give a lot of insight into what the ecosystem is doing, and where it is heading. I have been asking those questions of startup ecosystems here in the U.S. and across the globe to compile information for my presentation at Mashable Social Media Day Italy. What would you advise to someone with an idea to create a startup but no management or technical skills? The value of a startup is the execution of an idea, not the idea itself, so a great deal of technical and management skills is required by the founders. To gain technical skills they should surround themselves with technical mentors and start learning at an aggressive rate. They should be so immersed in their industry that they could be considered an expert in it. As for management, this is much, much harder to learn. Long-term company success requires a sustainable way to manage and lead people. Anyone in a leadership role will need to have mastered Empathy, Emotional Intelligence, and Self-Awareness. I would advise a founder to learn as much about themselves as possible through the use of a therapist or a life coach to see if they can grow those qualities enough to manage a startup. What do you expect from participation to Mashable Social Media Day Italy as special guest, and why one should register and join to this event, on your opinion? From my participation I am hoping to open people’s minds to be more deliberate about the way they create connections between people, startups, communities, and cities that they live in. People should register for this event if they feel isolated in their startup community and want to grow their startup or the community that the startup is connected to. Attendees can learn from the successes and mistakes of other startup communities, so they know how to address problems that arise in their own startups and the cities in which those startups live. 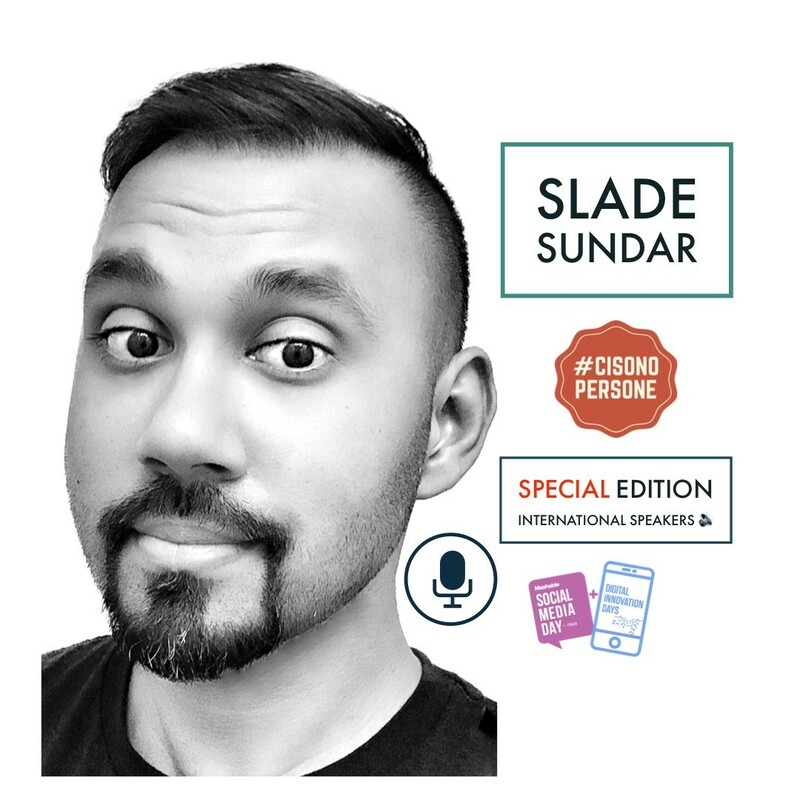 Thank you so much Slade, can’t wait to see you live in October on #SMDAYIT stage!